Marketing WITH channel partners, eg for lead generation among end users. Refuse to co-fund syndicated Inbound Marketing tactics [under the false pretext that they are not strictly quantifiable and containable "lead generation", but in reality because most vendors' marketers still don't "get" social media / pull marketing]! Put too much money in telemarketing and events, despite ever diminishing returns and skyrocketting "no show"! Dismiss Facebook [wrongly seen as B2C and/or for "personal stuff" only] and Twitter [wrongly seen as insignificant in France]! Export to PDF boring old-fashioned Powerpoint presentations, filled with copyright notices, so that nobody can remix, reuse, share and spread the word [and, of course, forget to make them accessible and downloadable on Slideshare or Scribd, which would be too convenient for partners and prospects and too good for SEO]! Think that posting Blog articles, delivering curation and participating to LinkedIn/Viadeo groups/hubs are a waste of their precious time... and thus, continue to struggle with blog content! Educate and enable marketing staff and channel partners in the area of Social Media and Social CRM. Accept vendor / partner independence and contextual only loyalty and start collaborating with relevant coopetitors to grow the SaaS / Cloud market together [eg help business partners network and collaborate with other partners, even if they are affiliated with competitive vendors!]. Mix offline and online tactics, eg run both Networking Events [see the IBM SaaS and Cloud Forum] and Virtual Events, develop Community Management without limiting it to online! 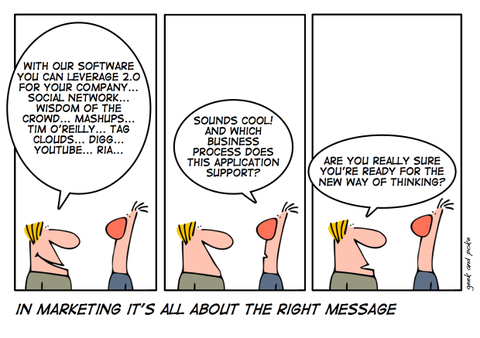 What are your 2011 predictions for SaaS and Cloud Channel Marketing ? Happy New Year, Feet on the Ground, Head above the Cloud!